Anyone can apply one’s hermeneutical expertise or skills in the art of deciphering Scriptures; but can your plain, simple common sense see clearly that 2,000 years-or-so of history has failed to produce a level of status where we can say God’s Kingdom is truly reigning as it should? Even by the lesser human standards, much more so by divine standards we have shown from the examples we have shown here of the Jerusalem firstfruits? And be honest, can you say that your participation in that spiritual plan fits perfectly those simple, demonstrated standards of God? Has your submission to human regulations for legal approval to call the Lord’s body by a specific title truly pleases Him, you or the rulers? And by so doing, has not your choice put you in opposition to another who prefers another title, as well as to God Who abhors divisions? Is your chosen title one that the early disciples used as a State-approved title as well or, as you obviously claim, an exclusive God-approved (“biblical”) title (and no other) to be used by all and not by you alone? Is this not the very mother-spirit of denominationalism that started everyone down the road to religious schism with the help of the State’s regulating powers? There is no way to understand this revealed essential teaching of Jesus and ever reconciling it with modern Organized Religion and its diverse ways. Every sectarian, mainstream, cultic and even so-called non-denominational (yet, ironically, still denominated and State-approved) church teacher will deny in single chorus these arguments as unbiblical and impractical. Their failure to see the intentions of the Lord is borne by their adamant refusal to see themselves as agents of the very schism and partition that the powers and principalities of this world have established in lieu of the pure, simple and joyful faith and obedience of the firstfruits in Jerusalem on Pentecost Day. For there in that narrative lies the very root of the fulfillment of all of Christ’s teaching right after He began to reign and just before the world took over control of the early assemblies. Since then, He has prepared the coming day of reckoning when all those who boast of being teachers of God will be exposed as being poor, naked and blind. As Jesus had told the early disciples, “Buy from Me refined gold to make you rich, white garments that you may be clothed and eye salve that you may see.” (Rev. 3:17, 18) Are you so blind you cannot see your own nakedness? Or are you so poor and proud you cannot even beg the Lord for white garments? The churches in Asia had a reckoning with the Lord just as we have one with Him at the proper time. Do not be deceived and think the kingdoms of this world will be raised up to Heaven to be exalted as the Kingdom of the Lord, a pure and perfect offering to the Father. Do not think for a moment that Organized Religions, patterned after the defunct and abolished systems of the ancient times will pass for the true Kingdom of Christ He established and cleansed by His Spirit in Jerusalem at its birth during the time of the apostles. Those apostles did not establish churches, sects, denominations or fellowships. They harvested souls that became the kingdoms of Christ which He sowed in other parts of the world and, effectively, in His heavenly realms. Yes, Jesus Christ promised to establish a Kingdom beholden to no human authority, law or economy. And He did just that. His Kingdom, even while it dwells on Earth, is a perfectly free and thriving entity in itself and by itself. And you are, if you truly are in His Kingdom. By the way, why then does it say “the kingdoms of this world are become the kingdoms of our Lord” if God has only One Kingdom? Does it connote that each kingdom, at least 3 general categories we know, is a separate kingdom under His rule? It could mean that each one of them has a power over it. Furthermore, each sub-category, such as a business conglomerate in Europe or a cultic denominational in South Africa, could be under a principality ruled over by that higher power. But how could these spiritual forces be called kingdoms of Christ? What does the verse really mean? Firstly, it would seem rather telling that the breaking down of the world into these divisions would not be a product of divine will then, for Jesus always taught about the One Flock and the One Kingdom and prayed earnestly for His followers to be One, just as He and the Father are One. Secondly, when He arrived on the scene, the whole world had already been partitioned into cities and nations and kingdoms. Thirdly, we should remember that those resulting divisions did not really come from God, for it was a result of a punishment against people who dared to challenge His rule. Those who built the tower of Babel originally spoke one language and had one purpose – precisely what the apostles kept teaching and working for (mind and purpose, that is). We can, therefore, say that the present division of the world into kingdoms, denominations, parties and economic unions are patently of human design and has definitely no divine precedence. To say God encouraged or approved it misses the gravity of the present situation in the mind of God. Finally, the fragmentation of the world that has brought about so many wars, conflicts and bloodshed since the beginning of time (many waged by so-called people of God or even Christians) could never be a hallmark of the reign of God even upon the world today. Hence, when John wrote that the divided earthly kingdoms belong now as kingdoms of the Lord, Who reigns in Heaven, it could only mean that, at the present, Christ claims ownership and authority over each and every part, although not all the people within each part follow Him as their Lord and King. Did not Christ say that the Kingdom of God is “within you”? (Luke 17:21) And did we not prove already that each believer is a temple or residence of the Holy Spirit, Who is Lord and God as well? (Why should He need a living temple on Earth if He were but an impersonal idea, force or energy?) It is clear that each person who accepts the authority and rule of Christ in his or her life is a kingdom unto that person. Jesus sits as Supreme President, High Priest and CEO in that person’s heart and life. Whereas a person may actually be working or living within a worldly kingdom ruled by a wicked spiritual power and within an earthly division controlled by a corruptive principality, that person’s allegiance is to God through faith and by profession. (Though Joseph lived and worked as a servant of Pharaoh in Egypt, he was a true and faithful servant of Yahweh. Was there ever a doubt about his allegiance?) That temple – that is, his or her body — is Christ’s and He lives there through the Holy Spirit. Hence, the church in Ephesus may have been either a big assembly of believers (perhaps, a precursor of our modern denomination) or a collection of believers who assembled separately in various places (in their homes, as their practice was). Besides, the word “ekklesia” or “church” does not always mean a single gathering of ALL believers but a generic term to refer to all “called-out” in a city or even household. Unfortunately, included within that assembly were some people who worked under the influence of Satanic forces, teaching abominable doctrines. In response to John’s admonition, active members of that assembly who managed to discern the truth through the Holy Spirit must have escaped condemnation by either remaining faithful in their personal faith and lives or, most probably, separated themselves. Those who failed to obey the Lord, may have continued to fellowship with those people, leaving an assembly with members who stood condemned in the eyes of God. That always happens when Satan enters into the family of God. Nevertheless, every true and faithful believer, wherever he or she goes, remains a pure temple or a kingdom under the Lord. Christ’s kingdom, in that sense, remains pure and perfect. Based on this discussion, we can them conclude that the Lord did begin to rule over the kingdoms of this world through obedient individual believers who were in worldly kingdoms but were not servants of those kingdoms but servants of the Lord. Although each person formerly was or is still a worldly temple or kingdom following the dictates of a wicked spirit, turning over one’s allegiance to Christ converts that person into a temple and kingdom of the Lord. That person does not necessarily have to leave or be free of that environment. This is consistent with Peter’s picture of believers as a “royal priesthood, a holy nation” (I Pet. 2:9) – a whole nation of royal priests whom Peter addressed as “pilgrims of the Dispersion in Pontus, Galatia, Cappadocia, Asia, and Bythinia”. Yes, a scattered people who constituted a “holy nation” – a Kingdom, if you please! Each priest then presides over his or her own temple, offering praises to God, and leaving no room for so-called lay people or non-priest believers. Warning: If you are not a priest, you do not belong to Christ. 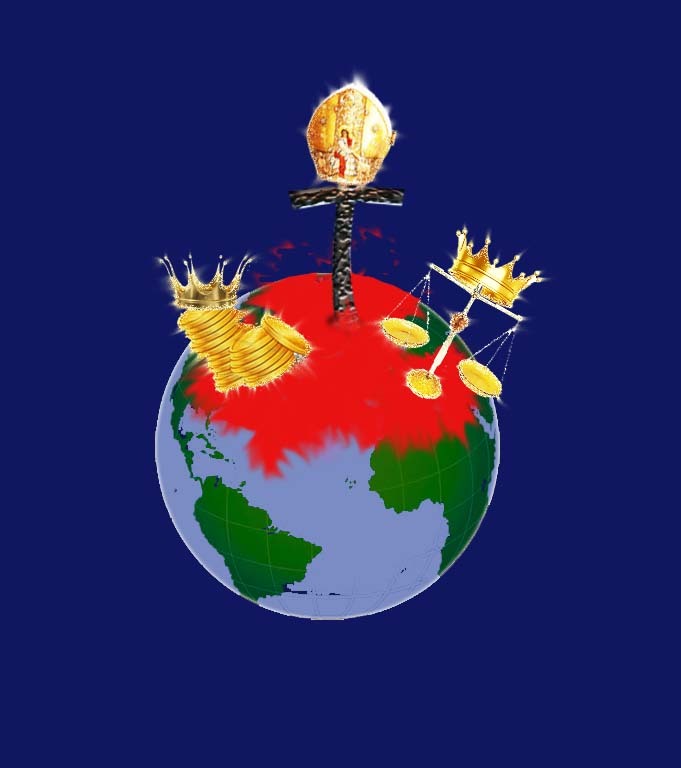 Jesus Christ reigns in Heaven as High Priest over a “holy nation” of “royal priests”. In Heaven, He is the One True Living Temple. On Earth, He rules over many similar living kingdoms and temples. Therefore, those who build or plan to build temples, sanctuaries, cathedrals, ashrams or shrines worship “in matter and falsehood” not “in spirit and truth”. Sorry, but Christ has changed the paradigm; anyone who remains in the old way does not walk the New and Living Way. In a way, Jesus picks ripe fruits from the tree He had previously planted in this world, which had been taken over by Satan, and puts each harvest into the same earthly garden to produce more good fruit. Whereas, Satan used to own the fruit, it now grows and produces fruit for the Lord. God owns that new plant, not Satan. While many unripe fruits remain in the tree, Jesus and His workers labor hard to harvest as many. Oftentimes, fruits go rotten and never end up planted in good soil and die. Why does Christ not reclaim the whole tree then? Why pick one fruit at a time? Remember that God once planted a perfect garden. Satan spread poison over that garden and made it become unfruitful. God had to destroy the whole garden at one time because of widespread rottenness by washing it away with a flood. He then planted another garden. Today, that garden is a million times more corrupt because of sin and disobedience. The trees that now grow in this garden were planted and cultivated by a wicked gardener, until the original Owner came back to reclaim it. The Lord owns this worldly garden once again. Yet, He does not force the plants to grow and bear fruit by magic or by some supernatural force in order to save them all. His laws remain at work – all natural, physical, celestial, biological, moral, social and spiritual laws. All those laws applied and still apply in the making and the sustenance of everything in that garden. Just as He gave the first garden caretakers the choice to act according to their free will, He allows each one in the present garden to do same. Once planted, a fruit becomes a tree and bears fruits to eventually become a garden as well. Each garden becomes a flourishing temple and a living kingdom built, kept and nurtured by the Lord. If it turns into a corrupt garden, the choice is not God’s. He can only rule over something or someone that wants to be ruled by Him. (Ruling over robots is certainly not a mark of divinity but of selfishness and depravity.) This, however, is not a law He cannot break; this is merely how He creates and how He loves His Creation. If you question that, then you are of all beings most corrupt – only demons think that way. God gives good things; and to question why He does so is questioning the very reason for the existence of Creation. Job’s sin was similar: He praised God for all good and “evil things” he had received from God; yet, he questioned why he was born at all. Satan questioned Eve why she could not eat of the forbidden fruit (Trick #1: Trying to lead Eve to question God’s law which was good). She said God said so – true and right. Satan asked her what would happen if she did (Trick #2: Testing Eve and leading her to doubt the result of disobedience — death). She said she would die – true and right. Satan said she will not and that she could become like God if she ate (Trick #3: Giving Eve an alternative world-view – a lie — that removes God and His law entirely from a person’s world-view). Eve, at that point, saw the beautiful fruit as something which promised her more than what she thought she did not have. She now questioned or doubted that what she had was created for her own enjoyment and for her to live. Without any further word, she finally took the final step to sin by giving in to something that pleased her eyes, her flesh and her pride, for it was also created by God but not for her good and enjoyment. She broke God’s law planted in her mind by replacing it with the seed planted by Satan, producing the fruit of sin-and-death. Each person today has the same choice as Eve and Adam had. Everything is created. There are those who deny or doubt that very Creation. We know where that poison is from. Adam and Eve saw and talked to God. They lived to almost a millennium and passed on the wisdom they gained through their experience in the Garden to their children. Many of their children lived to be as old as the first parents. Many today do not believe that, in spite of the fact that some of Adam’s grandchildren wrote books and gave testimonies of the beginnings of this world. They read and believe fiction writers and false writers but do not read or believe fact writers and true writers. They read and believe the world’s history but do not read and believe the Lord’s history. They follow world leaders but disobey the Lord of Heaven. They idolize and acquire riches and power but do not worship and desire the source of true wealth and spiritual power. They see Creation but deny a Creator. All the kingdoms of this world are being judged by the word and testimony of the Lord Jesus today; for He created, cared, recreated, came and conquered and now reigns over all these kingdoms through and along with His faithful followers. Either each person is an ambassador or administrator of the Kingdom of God, dispensing His grace and blessings as a faithful servant, or a worker of iniquity serving the wicked powers of this world – hence, an enemy of God.